Universal’s ascendancy in the theme park arena over the last 5 years or so has been remarkable. They’ve transformed (sorry) themselves from a second rate Disney, competing in gate figures with the likes of Cedar Fair and Six Flags, to a resort chain knocking right on the Mouse’s door. They’ve invested massive resources over the half decade span in order to bring all their parks up to scratch, and most importantly they’ve developed some world-class attractions. The fantastic Simpsons Ride began the push in 2008, Hollywood Rip, Ride, Rocket followed as they targeted the thrill market, and Harry Potter was the true catalyst in 2010 at their Islands of Adventure park in Orlando (Remember Universal Orlando has two parks; Islands of Adventure and Universal Studios Florida). But for me one ride stands out from all the rest: Transformers. 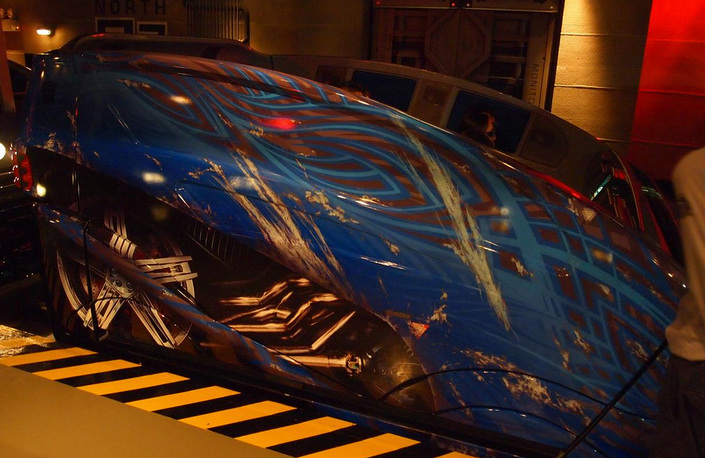 Unusually Transformers didn’t start out life in one of the American parks; it actually first opened in Singapore in December 2011, and this is the particular ride I will be reviewing, whilst comparing and contrasting to Hollywood’s version. Singapore’s small Universal Studios (which I have just reviewed as a whole) opened coincidentally in 2010 (Not really as a part of Univeral’s grand push; it’s owned and operated by a completely separate external company, Resorts World, but they do work closely with Universal’s creative team to ensure a true experience) and, along with classic rides such as The Mummy and Shrek 4D, the brand new Transformers was debuted. I can only assume that Universal allowed Singapore to have the ride first in order to iron out bugs, and also to test the waters; to ensure reception was positive before allowing its biggest audience, America, on it. Reception was extremely positive and within a couple of months Hollywood announced they would be opening the second version, with Orlando opening, as of now, the latest one at Universal Studios Florida a year later, early this Summer. So what exactly is this magical ride? Well, to try and summarise, it’s a 3D simulator dark ride. Passengers ride in a simulator motion platform with the abilty to tilt in all directions, slide on its base and rotate 360°, which is also mounted to a wheel base; moving along a track whilst interacting with a number of large, 3D screens. The ride is an upgraded version of the groundbreaking Amazing Adventures of Spiderman ride at the aforementioned Islands of Adventures, which opened in 1999. Spiderman was and still is a phenomenal ride; however the team at Universal Creative saw room for improvement, combined it with a hugely popular film franchise and began the life of an epic new attraction. Transformers is located in the unenthusiastically named ‘Sci-Fi City’ section of the park, and is accessed directly from the street. Its location is one thing that gives it the edge over the Hollywood version; in California the ride is housed in a large, obvious warehouse with no attempt to integrate the structure externally into its surroundings. In Singapore however the entrance is blended into the Sci-Fi backdrop, which makes it feel a lot more like a real building complex. After a little bland cattle pen queuing you enter the heavily themed NEST (Nonbiological Extraterrestrial Species Treaty) headquarters, which is under attack by the evil Decepticons so they can get their grubby hands on the Allspark, an incredibly powerful energy source capable of giving life to machines. 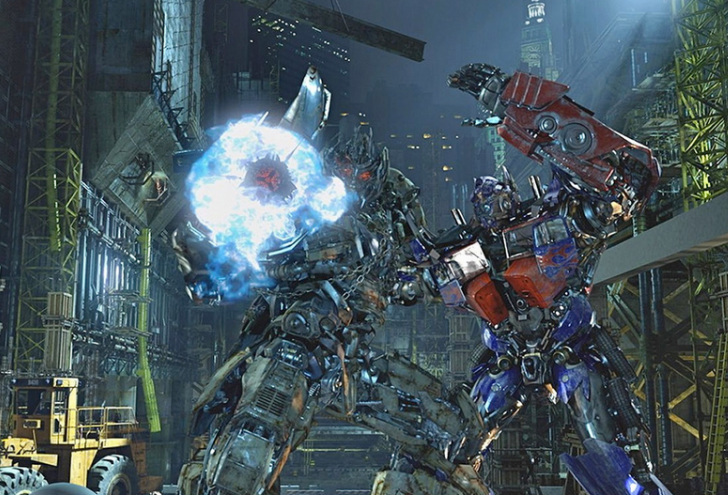 There are dozens of screens showing the distressed good guys being attacked, as Optimus Prime, the leader of the good Autobots, prepares you for a mission. The idea is that you are aboard a particular Transformer called EVAC, who specialises in transporting humans. You are repeatedly informed that EVAC has never actually been on a real assignment, and that your future does not look good. Nevertheless you grab your 3D ‘Battle Glasses’ and hop on board. As sirens blare and EVAC shouts stuff at you, you are plunged into a beautifully immersive world of huge robots smashing the crap out of each other. I won’t describe the entire ride plot, but you spend a large part of the opening segments wrestling with Decepticons as Optimus Prime fights them off, you’re almost hit by a train and a live action fireball from Megatron (leader of the Decepticons). You’re digested entirely by the vortex mouth of Devastator, before finally being hurled off a 40 storey building and back down to terra firma. The ride is long. It’s a good 4 and a half minutes, and it’s non-stop action. Optimus Prime gives a final speech as he kneels down; he looks you in the eyes and informs you that ‘Your bravery has saved the planet.’ Even as an ‘adult’ with no real interest in Transformers it’s an epic moment, I can only imagine what it’s like for a fanatic little kid. It builds the action very effectively; at first you watch the battle from a distance, then you begin to interact with the screens, before actually seemingly moving through them and into the mayhem. One of the problems with Spiderman is that it’s an animated film (The ride has nothing to do with the Sam Raimi films of the noughties; it was built before them). It’s still hugely effective, but interacting with clearly animated, cartoonish humans takes a little bit of the edge off of it. Transformers, whilst obviously still animated in the sense that it is mainly CGI, is much more realistic; 12 years of technology upgrades, and the fact that the characters are machines rather than humans, means that the whole universe is far more immersive and believable. The 3D also takes a step up; I don’t know the specific details, but the 3D is much less blurry and the picture quality is generally sharper. The mechanical leap that Transformers takes is one that almost no one (I certainly didn’t) notices. Spiderman has an entirely flat track; sure it takes sharp hairpin turns, but it remains on one level. Transformers makes better use of space by being spread across two levels. The trick is getting between each one. There are two elevators during the ride which shift you up and down, and they are so well integrated that you simply don’t notice them, (they both occur whilst you are facing particularly large screens; in both cases you are moving into the screen at an odd angle, which disguises the genuine movement of the car.) Spoiler alert: the first occurs after the second screen as you reverse away from Grindor (when he gets hit by a train), and the second is during the final plunge from the rooftops before you’re caught by Bumblebee. These points may seem minor, but the sum of the parts is a world class ride that has almost no rival. And having said that, we can talk all day about technical this-and-that, but all of it pales in comparison to the sheer atmosphere of the thing. Many rides across the globe, Disney, Universal or neither, are guilty of loose theming; they carry the name of a brand but really they’re just regular rides draped in logos and music. But this isn’t just a ride that’s themed to Transformers; it is Transformers, and it was certainly a lot more enjoyable than the second film in the series (I didn’t even see the third). But that doesn’t mean you won’t enjoy it if you’re not a fan, I’m certainly not and I have never come off of a ride with a bigger smile. That’s what theme parks are about; pure enjoyment. Transformers doesn’t let up from the moment you get in the queue to the moment you leave the gift shop. 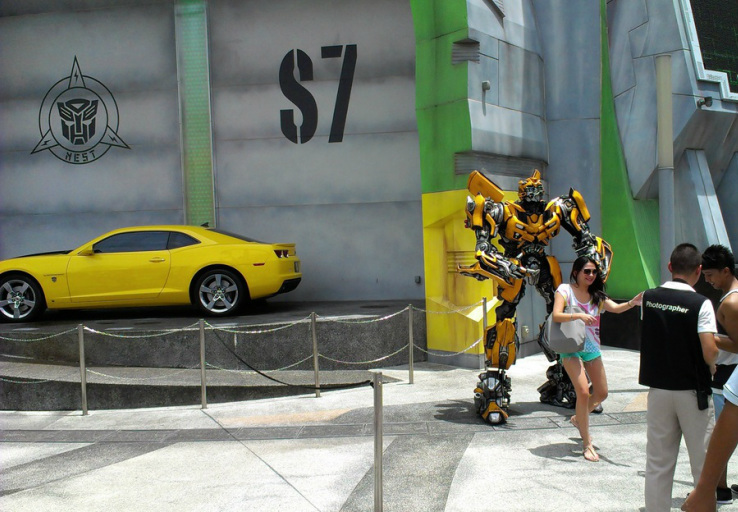 It’s truly a one-of-a-kind attraction and whether you’re in Singapore, Hollywood or Florida it's not to be missed.